A Colorado oasis of peace and beauty, surrounded by spectacular natural beauty and panoramic views of the Rockies, Sacred Heart Retreat House is the perfect setting for solitude, reflection and prayer. We offer summer directed retreats as well as individual directed retreats year round. 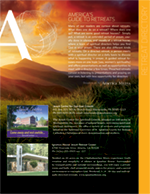 For more information, visit www.sacredheartretreat.org.